Welcome. Although I'm not scheduling appointments, please feel free to explore the site. Perhaps you'll find some material that speaks to you. Greetings from someone perhaps a bit like yourself, if over the years you've worn more hats than you anticipated and possibly taken some hits, as well. Thus, you may know firsthand some of the ways life messes with plans, expectations, and/or hopes now and then. To support seasoned women such as ourselves in dealing with these setbacks and/or embarking upon new paths, I trained and became certified as a life coach. This website serves two purposes: mainly to share some of the things I've learned over a lifetime, in case any of those might be useful to others, but also to provide a means of contacting me. Please explore the site as much as you'd like, and don't hesitate to ask questions or make suggestions or requests. 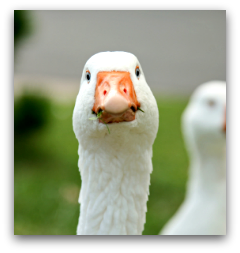 In so doing, however, please understand two things: (a) I am a coach, not a therapist (see Disclaimer); (b) while reading the material at this site, you may experience the occasional challenge and/or "goose." Although the "gooser" may look fairly benign, she Is still a goose and thus capable of assertive encouragement now and then. Over the years and among other things, I've served as a Peace Corps volunteer in the Caribbean; taught school; helped manage a work-release program for federal prisoners; edited countless documents in public health, water/sanitation, and international development; and served as volunteer, grant writer, and occasional board member for charitable organizations. Hardly a "focused" background, is it? But also not that unusual, I think, as life sometimes requires more flexibility and compromise than may feel comfortable at a given moment. Perhaps you've noted this phenomenon yourself now and then, yes? In my own case, just as I'd decided in my mid-50s to focus fairly ruthlessly on my own stuff, the "Fates" started messing with me again: serial health issues, my own and also those of loved ones; aging parents with Big support needs; fallout from goals deferred...etc. But there were also some good times during that period, which helped me stagger along until my life eventually lightened up. And why even share those details? To add yet more evidence that the journeys of others are often neither shorter nor more straightforward than our own...and to encourage you to keep plugging along yourself during those times when Life fails to match your expectations/hopes. If your own odyssey has included unexpected twists, turns, detours, and even blockages, please bear something in mind: that was then. If now you're considering an alternate route or even a brand new journey, perhaps you might also stay open to broadening and/or deepening your gaze...or perhaps shifting its direction entirely, should any of those feel right for you at this time. In addition, you might prepare yourself for the clutching hands of habit, health issues, any needs and/or expectations not your own, this month's crisis (or crises), et cetera. Meanwhile, though, three cheers and a parade if you're looking closely at your own wants and needs. You could be taking the first steps of a great "trip." So, two votes (one for me, one for the goose, right? ): (a) keep taking those steps, and see where they lead you; (b) remember to have some laughs along the way! And, as always, "may the Force be with you" as you go.